Whether you are buying stud earrings to treat yourself, as an investment piece or as a special gift for a loved one, you will get a better deal on your if you take a little time to do some research. Diamond stud earrings make timeless gifts. They can mark a family occasion, such as school graduation, or they can be a gift of love for an anniversary or other remembrance. Whatever the reason for giving, purchasing diamond earrings requires a little advanced research. If you have decided diamond stud earring, please decide your budget first. Be realistic. Only you know what you can comfortably afford, but once you’ve worked it out, it’s time to get best value for money. Use this handy buying guide to help you as you research and eventually decide on a gorgeous pair of diamond stud earrings. 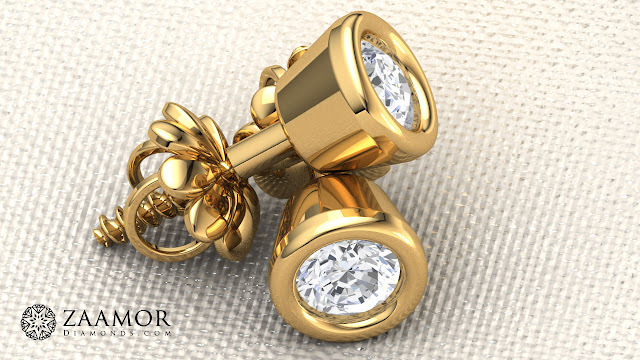 Stud earrings come in the usual assortment of precious metals, from Gold; yellow and white as well as Platinum. You may have your own preference when it comes to the metal or – if you’re buying diamond earrings as a gift – you will want to take into account what jewellery the recipient loves and wears. Most of you have at least heard of the four Cs of cut, carat, clarity, and color. However, since earrings are not as openly visible as a pendant, nor as scrutinized as an engagement ring, standards can be relaxed just a bit. Very good quality, as opposed to exceptional quality, can be a very good thing. The most common diamond shapes used for stud earrings are round, Asscher, and princess cut diamonds. Basically, any diamond cut that lends itself to having equal proportions is well suited to be a stud earring. That is why the circular shape of the round and square shapes of princess and Asscher are so popular. On the contrary, marquise and pear shaped diamonds are the least common diamond cuts used for studs. Diamond studs usually have minimalist settings, meaning there is no way to “hide” a smaller carat weight. Also, keep in mind that if you are looking at a pair of diamond studs online, the “total carat weight” listed in the carat weight for the two studs combined, not each stud. Luckily, since you can save money on other 4C grades such as clarity and color, you may find room in your budget for a larger carat weight. Clarity is a measure of the number of internal or external flaws or inclusions a diamond has. Flawless diamonds are very rare and therefore more expensive. Unless you plan to buy huge diamonds and invite your friends and relatives to study them up-close, the diamond’s clarity probably doesn’t matter very much. In most cases, you would need a magnifying glass to see tiny inclusions within the diamond anyway. The absence of color is usually the goal with white diamonds. The GIA rates stones with a letter grade from D, which is completely colorless, through Z, which is light yellow or brown. Most commercial diamonds are in the D through J category, which is considered colorless to near colorless. Unlike many inclusions and blemishes, color is at least somewhat visible to the naked eye. Stones around the H and I grades would be good for stud earrings. Prong and basket settings are the most common for diamond studs. Both of these setting types are classic, minimalist, and will showcase the diamond. 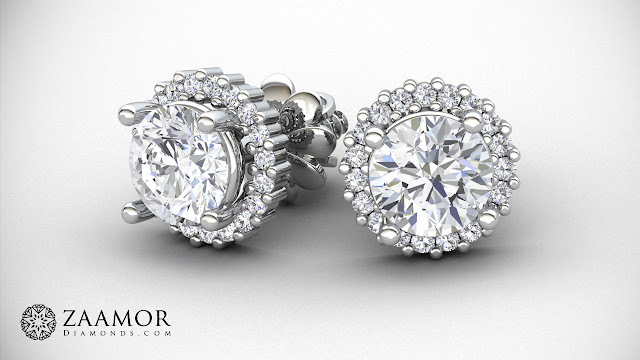 For added sparkle, many of our customers who purchase diamond stud earrings opt for a halo setting. A diamond halo will help to enhance earrings with a lower carat weight. Push backs are a safe choice for earring backs. In general, they are the most popular earring back style on the market, because they are easy to use and comfortable for sensitive ears. Some earring lovers prefer screw backs. Screw backs are thicker in diameter and the most secure option for stud earrings. If you or your loved one is concerned about the diamond studs falling out, screw backs are the best option. Who can wear Diamond Studs? Pay close attention to skin tone, hair color, ear size, and the proportions of the face to work out which diamond shape and setting style will look the best. 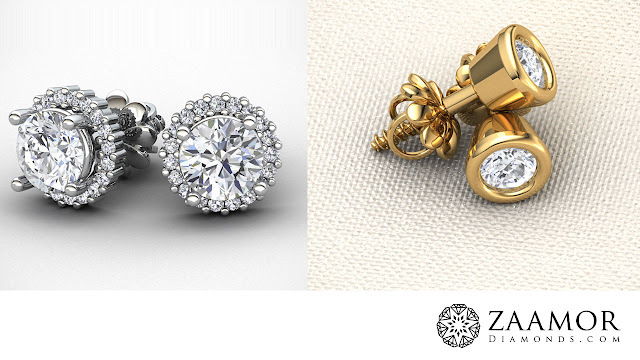 The upside of having such versatility with diamond stud earrings is that you can customize them to fit anyone’s personal style, so let that be your guide. With the wide range of shapes and sizes available in diamond stud earrings, there's something to complement every occasion. Whether worn to lunch with friends, to a dressy cocktail party, or to an elegant evening event, diamond stud earrings match the moment. Look Dashing on New Year Eve! How to Check a Diamond is Fake or Real?